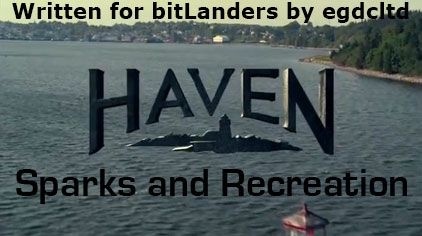 "Sparks and Recreation" is episode four of season two of Haven, a supernatural drama series loosely based on Stephen King's The Colorado Kid. In this episode, electricity starts randomly hitting people, Parker investigates the popular mayor and Duke is following a map. 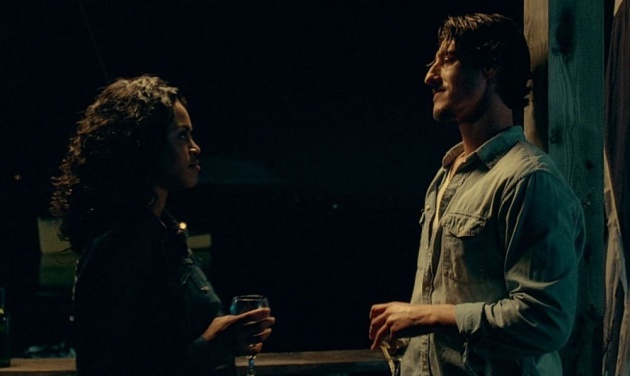 In the previous episode, "Love Machine", Parker 2 had gone out to the remote location identified by the GPS coordinates left in the book at Agent Howard's house. She found a building, but when she came out, most of her memory was gone (given how she entered the building, it wasn't a surprise that something happened to her). Parker 2 has now left Haven, but when Nathan and Parker went to the same spot, the building had disappeared. It's an important local youth baseball game, but when a bird lands on one of the lights, it gets electrocuted. The lights also start acting oddly - followed by the people. One side suddenly starts demanding their own player be called out. Then bolts of electricity - big ones - start arcing from the lights. The umpire gets hit by a piece of metal and the electricity arcs to him. What caused the electricity is a bit of a question - according to the person who 'cleans things up' that would require an EMP. The umpire managed to survive though. The mayor seems to weirdly affect people around him. They seem to think he's always right - and do what he says. He's more popular than can be explained. Parker, naturally, isn't affected. Then the mayor himself gets electrocuted. Fatally. His son also starts becoming oddly popular as well. Parker is still not affected (and the son hates it). More people start getting electrocuted. Duke is following a map that Parker 1 had, which is linked to the tattoos. Evi is following him - she thinks it's a treasure map. Instead, it may be something about how someone survived the tattoo people.